Wing span: 1 1/2 - 2 3/4 inches (3.8 - 7 cm). Identification: Upper surface of male wings bright, clear yellow with solid black edging; lower side of forewing with some dark submarginal spots; hindwing with silver cell spot rimmed with orange-pink, usually doubled. 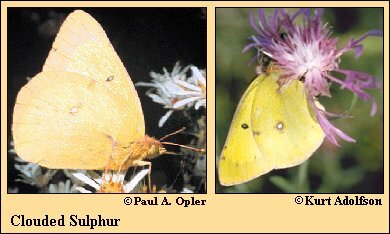 Female has 2 forms: yellow form with uneven black edging enclosing yellow spots, and a white form which is greenish-white rather than yellow. Spring and fall forms are smaller and less conspicuously marked. Life history: Eggs laid singly on host; caterpillars eat leaves. Hibernation is by third-stage caterpillars. Flight: Three flights in the north from May-October, 4-5 in the south from March-November. Caterpillar hosts: Plants in the pea family (Fabaceae) including alfalfa (Medicago sativa), white clover (Trifolium repens), and pea (Pisum sativum). Adult food: Flower nectar of many plants. Habitat: Many different open areas including fields, lawns, alfalfa and clover fields, road edges, meadows. Range: Alaska south through central and southeast Canada, all of conterminous United states except much of California, south Texas, and most of Florida.